In preparing this talk for tonight, I looked over some of the papers I wrote when I applied to rabbinical school at the Academy for Jewish Religion in June of 2008. I had spent the two semesters prior to that taking classes and trying very hard to let the administration know that I had what it took to be accepted. I agonized for days trying to articulate a personal theology, a statement of beliefs and practices, which was one of the required essays. Much has changed since then — I’m 8 years older — for one thing — my level of observance has grown, and my need to question and struggle with what I’ve been taught has increased. One of the first things I learned in rabbinical school was to start with the text; in this case, Vayetze, my bat mitzvah parashah. Vayetze Yaakov mi b’er shava, vayelekh haranan, “Jacob went out from Beer Sheva and went towards Haran. ” He was traveling to Haran to live with his uncle Laban, and to escape the wrath of his brother, Esau, who was angry at having been deprived of the blessing due him as first born son. For me, hamakom hazeh, “this place,” is life, and while I didn’t always know it, God has always been present. I wrote in my initial essay that “my God is the God of the Bible.” That has changed. One of my teachers, Dr. Ora Horn Prouser, commented in a class that “the God of the Bible isn’t the God I pray to.” And that has stuck with me. While I accept the full range of human-like emotions that God displays throughout the Torah, I much prefer the kind, loving God, el rachum v’chanun, rav chesed v’emet,” a God of compassion and mercy, one who acts with great kindness, one who forgives sin and understands that we are mere mortals. Forget the fact that women weren’t rabbis back then and it never occurred to anyone to encourage me. I couldn’t imagine that mere mortals could be rabbis. Rabbi Wallin was larger than life and knew so much. He always seemed to have the right saying from the Torah or the Talmud for the occasion. And read from the Torah that has no vowels??? Never in a million years. The good news is it didn’t take quite that long for me to learn. In high school, I joined USY and was amazed to find Jewish kids my age who loved to daven, loved to learn, and who thought it was perfectly normal to spend an hour or two after Shabbat lunch dancing and singing. In USY, I learned that there were more than two melodies for Adon Olam and more than one for Lecha Dodi, and I couldn’t wait to bring them back to B’nai Torah and introduce them. Rabbi Wallin would indulge me on occasion, and I could even lead an entire Friday night service with the exception of Barechu and Kaddish, which were reserved for men. Coming of age during “Women’s Lib,” I was adamant about gender equality in just about all areas of my life, even to the point of making a case to my father as to why I should be allowed to mow the lawn. What the heck was I thinking? It was fine until I ran over a snake. For some strange reason, it never occurred to me to question why girls and women didn’t count in the minyan, why we couldn’t read from the Torah, and why we got responsive English readings in shul, while the men got to open the ark. However, I almost had to be dragged into egalitarian practice. I was perfectly fine not counting in the minyan, especially when it came to shiva minyans. My husband, my father and a bunch of the other men would go, while I stayed home, made dinner and took care of the kids. I paid my shiva calls during the day. I saw counting in a minyan as an obligation, not a privilege, and it was an obligation I wasn’t ready to accept. Fast forward through the next 20 plus years. I went to college, went to work, got married, had kids and bought and built a business with my husband. I continued to be active in synagogue life; going to services, leading Junior Congregation, teaching and taking on a variety of responsibilities and leadership positions. The experience of being a congregant and a board member, living through two rabbinic searches, and living with the synagogue president during that time, is a definite advantage to me now as a congregational rabbi. When our congregation decided to become egalitarian with respect to gender, the two female co-presidents asked me to come on board as Ritual Vice President. I’ve joked since then that I was asked because I was the only person they could think of who knew what time services started. It was a somewhat reasonable assumption. When we moved to Trumbull my parents immediately became involved with the synagogue, and my mother still spends a good amount of time there. I didn’t know what it was like not to be in the building, and with a son preparing for his bar mitzvah, being there just about every Shabbat was a given at that point. Everyone assumed I knew way more than I really did. I assumed that, as Ritual VP, I would do what my predecessors did, which meant alternating between sitting on the bima looking handsome and running around looking important, rounding up the usual suspects for shiva minyans, and putting out the oneg and Kiddush. Our new Rabbi, Colin Brodie, started at the same time, and that image went straight down the tubes. He called me the gabbai, and I had to look up the word. I’m still not quite sure how it happened, but he asked me to daven maariv on his very first day, which was a Friday. Even though I had grown up on the bima, I was terrified. The words, “barechu et ado-nai, ha m’vorah” had never come out of my mouth before, and I spent three days practicing titkabel tslothon … in Kaddish Shalem. But it was a magical night for me, and it made a clear statement that the synagogue was now egalitarian. I became one of the two Torah readers, and when he would invite me to lead something, if I didn’t know it, I made it up — at least the melody. I’ve never been one to shy away from a challenge, and Colin often called me “unflappable,” especially when he would call or email me a week before Rosh Hashanah to tell me be was going to be a rabbi on a cruise ship, so he wouldn’t be in shul for the holidays. Time went by, we worked well together, and I learned more than I could have imagined. His wife Amanda, who is also a rabbi, tutored me in biblical Hebrew so I would know what I was reading. When she asked me about my homework one evening, her young son turned white and asked, “Ima gives you homework?” Learning never ends. Poor kid, he’s now a junior in high school. When Colin needed to be away for a Shabbat, I led services, including writing a Friday night sermon and the divrei Torah for Shabbat morning. At Kiddush, people would threaten to take up a collection to send me to rabbinical school. I would laugh. I explained that there was more to being a rabbi than leading services, and that I could never do “all that other stuff.” That other stuff included visiting sick people and officiating at funerals. At that point, it was difficult enough for me to sit through a funeral, even for someone I hardly knew. I couldn’t imagine having to actually deliver a eulogy, and not cry through it. At some point, I decided that perhaps I could do “that stuff,” and toyed with the idea of rabbinical school, but I had no idea where to start. I also assumed that I was probably too old to get into school. This is where I believe God stepped in. My husband, daughter and I were in Florida, in July, of all times, for a bar mitzvah. During Kiddush, I was seated next to a woman about my age, and she was pursuing a Master’s in Jewish Education online through JTS. Well, I thought, if she wasn’t too old, maybe I wasn’t. Next came the task of finding a place to study, and Colin and Amanda told me about someone they knew who was studying at AJR. I was thrilled to find a school where I was about the average age, as opposed to being old enough to be everyone’s mother. The first thing I learned in rabbinical school was how much I had to learn. I had very good synagogue skills and had enough Hebrew literacy to pass the entrance exam, but I was convinced that those common dreams, where you come to class and everyone else knows what’s going on, except for you, would turn into reality. On my very first day, my last class of the day was on Jeremiah and Ezekiel. The teacher went around the table asking each of us to introduce ourselves, say what year and program we were in, and something we knew about Jeremiah and Ezekiel. I was in in a total panic. I knew they wrote haftorahs; that was about it. The woman who spoke right before me said, “My name is Enid, I’m in my 4th year, and I know Jeremiah was a bullfrog.” You can feel my blood pressure dropping, right? Of course everyone laughed, and I felt the tension drain out of my body. I knew I was in the right place. I learned a lot about these two prophets, about the lawsuit formula prevalent in much of their writings, and how society shifted from collective to individual responsibility preceding and during the time of the Babylonian exile. That was what you might call an “aha” moment, when the light bulb goes off. For me it was a “duh!” moment that was a turning point in my life. I was there to learn, I didn’t need to know everything. As a sort of bookend, the day after my ordination, Rabbi Wallin, who hadn’t been able to attend, called to wish me well. He gave me some important advice: to not feel that I need to answer every question, and to not be afraid to say, “I don’t know, I’ll have to find out.” Shall we say I had a lot of wonderful teachers? I had the honor and privilege of serving a variety of congregations as a student rabbi, which is also called baptism by fire. Each one gave me a different perspective on the Jewish community, and gave me the opportunity to work with people from many backgrounds and with many different ways of engaging with Judaism. At each congregation I was challenged to think about my own way of engaging with our texts, traditions and teachings, and learned much about balancing my own observances and thoughts with those of others. I became a rabbi because I want to make Judaism accessible to Jews. When I wrote that in my application essay, I wasn’t quite sure what I meant, but I hoped it would impress the interviewers. They accepted me anyway. The reality is, I still don’t have it all figured out, but one thing I’ve learned is that it means meeting people where they are, regardless of their level of observance, their spirituality, their background or literacy. I see too many Jews who feel disconnected, and disenfranchised, perhaps they have negative memories of authoritarian synagogues or couldn’t find a sense of spirituality along with the dogma. Plus, growing up Jewish in America, in the shadow of the Holocaust, left many young Jews with the idea that they had to be Jewish, marry Jews and raise Jewish children as a way of thumbing their noses at Hitler. It wasn’t a joyful Judaism. I was lucky to grow up with a rabbi who loves everything about Judaism and Israel, and instilled, at least for me, a joy of Judaism and of being Jewish. Being a rabbi gives me the opportunity to be with people in times of joy and sorrow, and everything in between. Judaism has something to offer at every stage of life, and as a rabbi, I can do my best to make our sacred texts, traditions and teachings relevant to others. I amaze myself when the right teaching from the Talmud, or verse from the Torah, pops into my head at the right time, and when a sick individual or bereaved family tells me that they have been comforted by what I said and did, or perhaps didn’t say or do, I might as well have won a gold medal in figure skating, which is something else I began at a much later age than most people do. I can’t imagine, had I gone to rabbinical in my 20s, or even 30s, that I would have been prepared to be the rabbi I believe I can be today. My life experience informs what I’ve learned, and what I do. 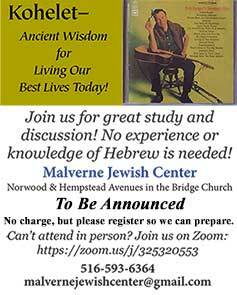 I have been blessed to join the community at the Malverne Jewish Center as its rabbi, and I very much look forward to learning with and from them. I’m excited about our future. For many of us, the Selichot service is the beginning of the Yamim Noraim, the Days of Awe, the High Holidays. It’s a time to reflect on the past year, and look forward to the coming year. To assess our strengths, our limitations, and decide how we will use the time we have left in this world, along with the gifts we’ve been given. When I took up figure skating at the age of 39, and then went to rabbinical school several years later, people would invariably say, “Wow, I couldn’t never do that!” I rarely said it out loud, but my thought was, “If I can, you probably can.” Living a full, happy and productive life doesn’t mean there won’t be any bumps, potholes, roadblocks or train wrecks along the way. There will be plenty, but they’re all part of life, and a life well lived. The new year of 5776 is a leap year. In Hebrew the term is shana m’ouberet, which we can translate as “a pregnant year,” pregnant with possibilities. As we enter the new year, I pray that each of us can incubate possibilities for creating a sacred future, at any age and every age. May we all be inscribed and sealed for a year of health, happiness and prosperity. May it be a year when all peoples work to understand and accept their differences and similarities, and may we see a world at Peace.